We are the renowned entity in the concerned domain to offer the best quality array of Semi Precious Stone. The provided stone is perfectly cut and finished under the direction of deft professionals in accordance with the defined industry norms. The provided stone is duly tested on various quality parameters by quality controllers to provide flawless range at patrons’ end. 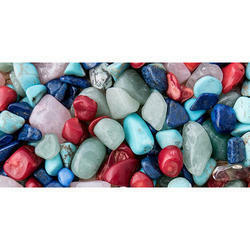 Beautiful semi precious stones available in various qualities. Polished and rough stones also available. Rose quartz is one of the most desirable varieties of quartz. The pink to rose red color is completely unique, unlike any other pink mineral species. The color is caused by iron and titanium impurities. Rose quartz is used as an ornamental stone and as a gemstone. It is also an alternate birthstone for the month of January. Our organization has successfully expanded its business in market owing to the offered elevated quality range of Blue Onyx Stone. 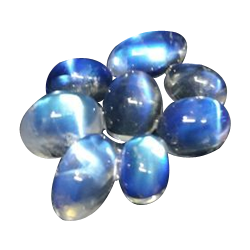 We are ranked amongst the foremost firm that is engaged in providing a wide range of Agate Pebbles. Quartz is the second-most-abundant mineral in the Earth's continental crust, after feldspar. It is made up of a continuous framework of SiO4 silicon–oxygen tetrahedra, with each oxygen being shared between two tetrahedra, giving an overall formula SiO2. Type Of Packing: MIN ORDER- 1 KGS PACKED IN BOTTLES ABOVE MIN ORDER- PACKED IN BULK PACKAGING. We are offering Copper Quartzite Stone to our clients. Extensively used in residential & commercial flooring, walls, pavements and kitchen counters, these stones are appreciated for their fine finish, impeccable design and high strength. Our Copper Quartzite Stone possesses the burnished hue of copper and provides a natural and exotic look to your living spaces. Sillimanite is a polymorph with two other minerals; kyanite and andalusite. A polymorph is a mineral that shares the same chemistry but a different crystal structure with another, or other, minerals. Sillimanite is the rarest of the three trimorphs. A variety of sillimanite is called "fibrolite". It is a common fibrous massive form. we are well reckoned as one of the prospering quartzite stone exporters based in india. Our natural quartzite stone is commonly used in construction purposes. Indian quartzite stone provided by us is available in various designs and dimensions to suit the need of the clients. Fine finishing and polish of our natural quartzite stone exhibit the assiduous efforts of our team. Quartz is one of the widely used mineral available in the market. We make available natural Quartz in various forms for meeting the exact needs of the clients. The company has also eased the customers by offering Quartz at affordable market price.